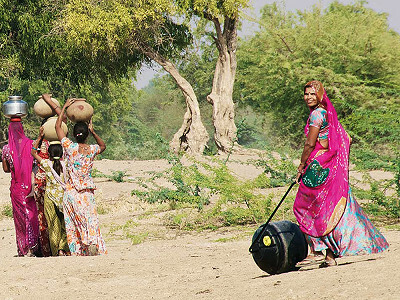 Even when clean water is available, it’s tough for many rural residents around the globe to collect and transport it. Some spend a quarter of their waking hours on obtaining necessary water. Wello helps with its WaterWheel, a durable, water transportation tool made from high-quality, food-grade HDPE. Founder Cynthia Koenig and her team worked with five countries in South Asia and sub-Saharan Africa to develop an affordable new take on the water roller. The WaterWheel is a 45 liter drum with two handles on each side that makes it easier to handle while filling and emptying. Its cap-in-cap design prevents contamination during use. Reinforced axles protect from wear and tear. And the design stays balanced even when filled to capacity, so it's easy to maneuver—even through rough terrain. For those who can pay for their WaterWheel, Wello has a for-profit branch that partners with governments, microfinanciers, and distributors. This gets more WaterWheels to more people and helps the organization be sustainable, too. Their nonprofit arm educates, conducts research, and assesses impact on the global water crisis. Donating just $50 helps give a family a WaterWheel and frees up time to spend together, attend school, or earn money. Hi, I'm Cynthia Koenig, founder of Wello. I think it’s unbelievable that hundreds of millions of women + girls spend hours every single day carrying heavy containers of water to their homes - yet still fail to meet their families’ basic requirements, missing out on school + job opportunities in the process. Wello is on a mission to deliver clean water to a thirsty world. We design products that people not only need, but want to use - affordable innovations that save time, improve health outcomes, and increase reliable access to safe water. I’m excited to share our story here on The Grommet. How did you get the idea to develop the WaterWheel? Wello is a social venture with the ambitious goal: to deliver clean water to a thirsty world. We design products and solutions that people not just need - but want. The vision for Wello was born out years of personal experience living and working in water scarce environments. While living and working in remote villages in Latin America + Africa, i struggled to haul enough water to meet her daily needs. I saw firsthand how the time, physical, health and emotional burdens of water collection disproportionately affected women and girls’ access to opportunity, ultimately trapping them and their entire families in the cycle of poverty – but I didn’t see how I could do much to change this. Later, while pursuing an MS / MBA at the Erb Institute for Global Sustainability at the University of Michigan, I took advantage of University grant funding to better understand the underlying factors driving the global water crisis and explore the feasibility of business approaches to poverty alleviation. What was supposed to be a 3-month trip became a full-time job + Wello was born! The possibility of becoming an entrepreneur wasn’t something I ever considered. In fact, I entered business school with the intention of career-switching from the nonprofit sector to strategy consulting. Wello started as a class project, and it wasn’t until a year after I graduated that I considered launching a company. In retrospect, it still sounds unlikely - launching a design + innovation company in a foreign country, with no team, no design background or manufacturing expertise! But - in reality, I didn’t need all of these skills at the start. My background in anthropology + business was ideal for Wello’s needs during our discovery and design validation stages. As the business evolved, my skillset expanded, our team grew and we built a network of advisors and supporters whose expertise and guidance to fill in the gaps. The WaterWheel is transforming the way people have been transporting water for over 100 years. Were there any challenges in trying to redefine a process that has been the same for so long? Over the course of 2 years, the Wello team has lived and worked in dozens of villages, carried hundreds of liters of water and engaged with thousands of potential consumers and sector experts across three continents. We prototyped, iterated, watched, listened, learned, measured… and then did it all again, and again, until we were positive that we had created a product that truly added value to consumers. That was the easy part! We know we got it right because when consumers try the WaterWheel, they almost always end up buying it. The bigger challenge is in making the WaterWheel widely available at an extremely affordable price. The people who want + need WaterWheels live in rural parts of the world where infrastructure is limited – our delivery + retail options are limited, and building out a custom distribution channel is expensive. Our solution – Wello’s for-profit sells WaterWheels to partner organiztions who have work closely with our target consumers – large NGOs, aid agencies, community organizations (like the Rotary Club), government and Corporate Social Responsibility Initiatives. Our nonprofit measures the impact of our products and dontates subsidized WaterWheels to communities in need. Wello is at an exciting point in our history – we commercialized our first product (the WaterWheel) in July 2015 and we’re scaling across India + beyond! We’re currently in the prototype phase with our second product, which will purify the water in the WaterWheel as it rolls. Our US 501c3 is currently fundraising for an initiative that will make headloading history in an entire district in india by June 2017! 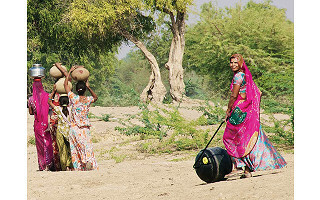 Even when clean water is available, it’s tough for many rural residents around the globe to collect and transport it. Some spend a quarter of their waking hours on obtaining necessary water. Wello helps with its WaterWheel, a durable, water transportation tool made from high-quality, food-grade HDPE. Founder Cynthia Koenig and her team worked with five countries in South Asia and sub-Saharan Africa to develop an affordable new take on the water roller. The WaterWheel is a 45 liter drum with two handles on each side that makes it easier to handle while filling and emptying. Its cap-in-cap design prevents contamination during use. Reinforced axles protect from wear and tear. And the design stays balanced even when filled to capacity, so it's easy to maneuver—even through rough terrain. For those who can pay for their WaterWheel, Wello has a for-profit branch that partners with governments, microfinanciers, and distributors. This gets more WaterWheels to more people and helps the organization be sustainable, too. Their nonprofit arm educates, conducts research, and assesses impact on the global water crisis.